“Fight for LA” is a campaign adopted by the Los Angeles Chargers to help boost current ticket sales and waitlist reservations for those wanting to secure tickets for the new Hollywood Park stadium which will be completed for the 2019 season. 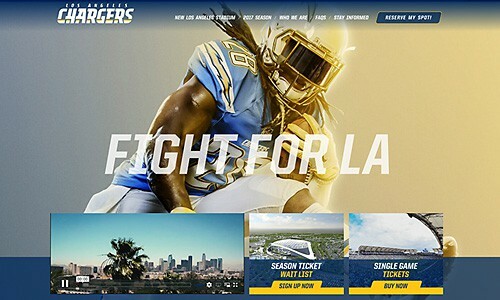 The FightForLA.com website was created to funnel traffic of those interested in season ticket information, premium seating options and signing up for the 2018 waitlist. The site is also used as an inbound marketing tool featuring numerous methods of lead capture. Schuler Design & Development was responsible for the website re-design along with email template and social media ad designs.